For Eastern Europe, 2014 was a watershed year. In response to the overthrow of the pro-Russian Ukrainian government of Viktor Yanukovych by a pro-Western street revolution in late 2013, Russia began a concerted series of covert and not so covert actions to destabilize Ukraine and assert control over vital Russian speaking provinces in the eastern portion of the country. In March 2014, Russia quickly seized control of the strategically vital Crimean Peninsula, home to Russia’s Black Sea Fleet, with a combination of information operations backed up by swarms of “little green men,” Russian Special Forces troops operating without insignia that posed as Russian-speaking Ukrainian “separatists” who seized vital government and military installations in the key port city of Sevastopol. Experiencing little resistance from the Ukrainian government and only token protests from the major powers of Europe, Vladimir Putin’s government next set their sights on the key border provinces of Ukraine with significant Russian minorities. Pawel Pieniazek, a freelance Polish reporter, was present in these disputed regions, especially the breakaway province of Donetsk, and provides a first-hand account of these critical and turbulent months in 2014. The reporting is both raw and insightful as he interviews soldiers, civilians, politicians, and even other reporters he encounters in his travel between the embattled cities and towns that often change hands in the confused and fluid fighting. Combining war reporting, photojournalism, and a travelogue, Pieniazek brings to life the stories of soldiers fighting for their cause, politicians seeking advantage in the chaos of the situation, but most of all, civilians caught in the middle of a conflict trying to find food and shelter while attempting to avoid being killed or maimed by random shelling. The photographs of normal European cityscapes marred by scarred and burned out buildings with derelict cars and occasional burned out tanks and other armored vehicles is a stark reminder that some of the most intense European fighting and shelling since the Yugoslav civil wars of the 1990s occurred in cities such as Donetsk, Mariupol, and Slovyansk throughout the summer and fall of 2014, most of it outside of the attention of the United States and the rest of Europe. Pieniazek was also in the country when the first Russian forces crossed the border into the breakaway provinces to provide covert support to the Moscow backed militias, and he was one of the first reporters on scene when these separatist forces used Russian made missiles to shoot down a Malaysian airliner in July 2014, killing all 298 people aboard. 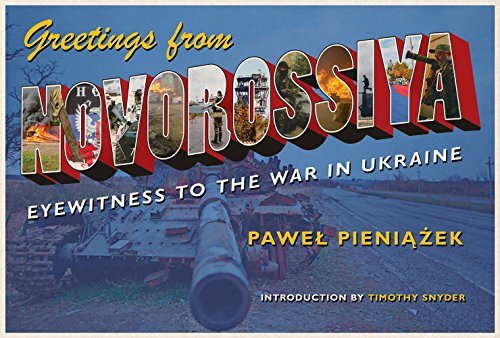 He provides a surreal account of the efforts of the separatists and their Russian allies to deflect blame for the shoot down to the Ukrainian government, and the lengths they went to concealing the crash debris and delaying European investigators trying to determine how the airliner was actually brought down. The book ends on a somewhat sour and grim note as both sides are temporarily exhausted by nearly nine months of costly fighting. Unfortunately, the author notes that it appears Russia was not only able to seize Crimea outright, but de facto cleave its neighbor of two provinces and change the strategic landscape of Eastern Europe. The situation in Ukraine remains tenuous today with the potential to flash back into major conflict at any time. This book offers a unique look into one of the world’s forgotten conflicts, offering a glimpse into the shadowy world of Russian power politics along its border as Putin seeks to reassert Russian power not only in Europe proper, but back onto the world stage.